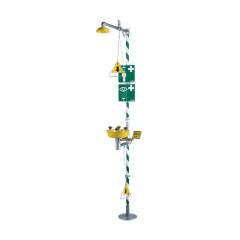 Krusman safety station with galvanized steel pipes, green/white stripe and shower head in powder-coated stainless steel. Stay-open ball valve, operated by a pull handle and pull rod for a crawling person. Eyewash 3864, each individual spray head has built-in flow control and filter. The eye/facewash is self-draining. Designed for minimum flow of 76 l/min at 2.4 bar pressure. Krusman Emergency Showers is a Swedish manufacturer and supplier of emergency showers and eye- and facewashes. We share our knowledge about equipment and regulations with our customers and provide them with risk measurements. Our main objective is to save lives. Our knowledge - your guarantee for safety.